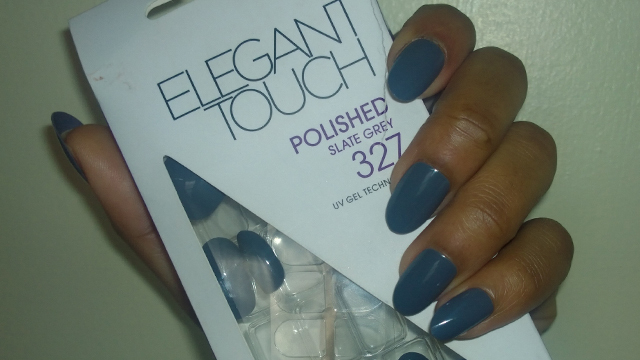 I love grey nails so I bought these Elegant Touch Nails in Polished Slate Grey 327. I was so happy to find grey nails I forgot to check the length – they’re medium and I usually wear short because my nail bed is really short. Medium comes up quite long on me but it was ok because I usually wear stick-on nails for short periods of time anyway. Despite the nails being quite long on me, I found the length and shape to be quite flattering on my hands. I enjoyed looking at my nails a little too much! Elegant Touch Nails require a two-step application- first apply the correct sized adhesive tab (22 are included) then apply the nail. I say this as the Elegant Touch Express nails are peel and stick – literally. Alternatively, these nails can be glued to the nail if you purchase separate nail glue. The UV protection is supposed to stop chips and fading although I noticed on one of the nails, there was the slightest chip. It was difficult to see so I wore it anyway and besides, I was only wearing the nails for one day. The nails are easy to take off, just peel from the cuticle end of the nail. I found that this shade of medium grey worked very well with my skin. I know that Elegant Touch do a range of grey nails so I think I will stock up once my epic spending ban has ended!